Access All Areas members have a new graphic design resource to download this week thanks to the design template specialists at BrandPacks. The Healthy Mind Brochure Template Pack is a collection of ready-made print design files for Adobe Illustrator and Adobe Photoshop, including an A3 brochure, A5 flyer, DL card, tri-fold leaflet, A4 poster and business cards. 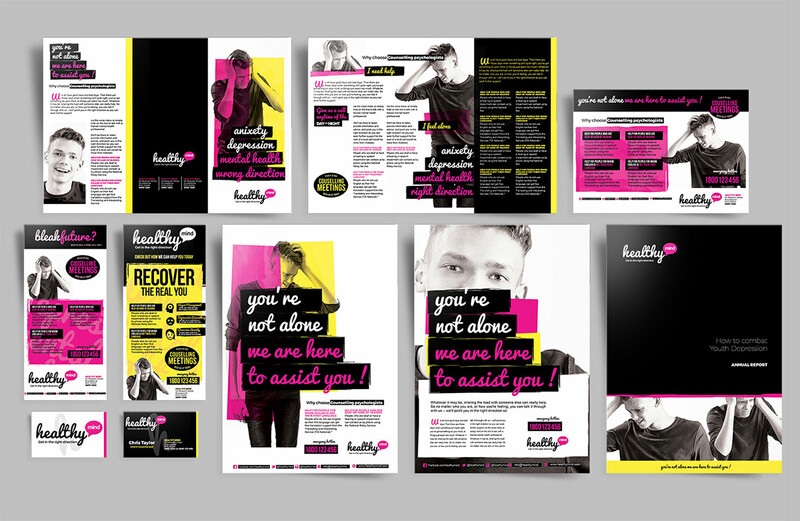 The colourful and energetic design is based on a counselling service by default, but this flexible style can be quickly rebranded for any type of business. All the elements within the templates are editable and all stock images are included! This full Healthy Mind Brochure Template Pack is now available for Access All Areas members to download. It contains 11 print ready design files for Illustrator and Photoshop, complete with crop marks and bleed. All stock images are included, and the supplied documentation provides links to the freely downloadable fonts required to preserve the original design. This particular pack is well suited for promoting charities, community organisations and youth clubs, or the images can be switched out to use this vibrant theme for all kinds of businesses. Thanks a lot Chris! These will help me out greatly!